A tiny hamlet on the edge of the sea, Bawdsey Quay is a great place to get away from it all. 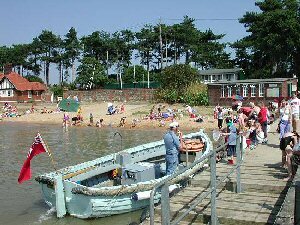 A few cottages, a sailing school, a sandy beach and a foot ferry (which takes you across the estuary mouth to the little fisherman's village of Felixstowe Ferry, two lovely pubs and a fresh fish stall). Ferry times (April to October) can be checked here. To confirm availability, ring 01394 282173 or 07709 411511.